Equal Justice Coalition chair Louis Tompros addresses the Walk to the Hill participants. Attorneys, law students, and bar association leaders packed the Massachusetts State House Hall of Flags January 24 for the 20th Annual Walk to the Hill for Civil Legal Aid. 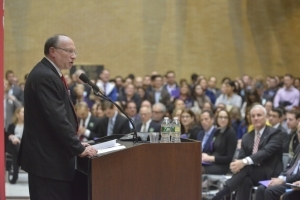 Led by Chief Justice Ralph Gants of the Massachusetts Supreme Judicial Court, more than 650 people assembled at the Equal Justice Coalition’s annual lobby day to advocate for a state budget increase of $5 million for civil legal aid programs in Massachusetts. “Civil legal aid is not only a moral obligation; it is a sound investment,” said Chief Justice Gants, noting the money invested in legal aid yields savings for the Commonwealth by preventing homelessness, saving medical costs, and recouping federal benefits. 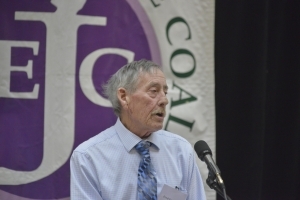 Fred Connelly, a teacher and construction worker from Quincy, told the story of how lawyers with Greater Boston Legal Services helped his family avoid homelessness when they were facing eviction from the home they have lived in for nearly 40 years. Injured and out of work, he couldn’t afford a lawyer to help him keep the house he built himself. Without the help of GBLS, “I know for a fact I would not have my house back today,” he said. In his budget filed the day before the walk, Gov. Charlie Baker included level funding for civil legal aid programs in Massachusetts – an appropriation of $21 million dollars. While appreciative of the governor’s continued support, Walk to the Hill speakers stressed that more funds are needed to ensure that the civil justice system is accessible to all. Last year, two thirds of eligible applicants for legal aid were turned away. 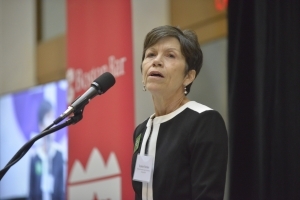 Created in 1999 in a collaboration between the Massachusetts Legal Assistance Corporation, the Boston Bar Association, and the Massachusetts Bar Association, the Equal Justice Coalition leads an annual campaign to increase appropriations for legal aid in Massachusetts.